Below, the small Deutschland shows she too can look very big from the right angle. The picture was taken at the 5th of may 2012 close to Velsen Noord at the Northsea Canal passage from Amsterdam to the North Sea. Deutschland is a well-known name is liner-history, although not for Peter Deilmann Reederei, CMV or Semester at Sea, but for HAPAG (Hamburg-Amerikanische Paketfahrt Aktien Gesellschaft). The first ship of this big German company was called Deutschland and they operated four ships of that name in their history. The most well-known Deutschland was the thirth one, a four-funnelled liner built in 1900. In 1919 this ship was not taken over by the Allied forces, like most German ships were after the first world war. This because the ship was in a very poor condition. So this was the only big German ship left in Germany at that time. Peter Deilmann's Deutschland, so can be called the fifth big German ship with this name. Peter Deilmann was a freightship-owner from the northern German province of Schleswig-Holstein and he had started operations in 1968. In 1972, with the start of a ferryservice between Neustadt in Holstein and the small island of Bornholm, he entered the passengertrade now under the name of Peter Deilmann Reederei. A small, 511-ton ship under the name of Nordlicht was used for this service. It seemed to be a good venture for Deilmann, as he bought two other small passengerferries, Nordwelle and Nordschau for daycruises from the homeport of Neustadt. Another ship, Nordbrise, was bought in 1976 and she started to undertake several longer cruises to Poland, Greenland and of course the German Democratic Republic. Also, this ship was used for a service between East and West Germany, very unusual for the time. Meanwhile, the ten freightships were sold and the company now concentrated solely on their passengerservices. The company grew and in 1979 they were able to have a new ship built, far larger then the smallish ships they had owned untill then. From the Howaldtswerke-Deutsche Werft in Kiel, Berlin was ordered by a group of German investors, of which Deilmann held a small share. But she was to be operated by Deilmann, so is regarded as the first true larger international cruiseship of the company. Being close to 8000 tons, she indeed was way bigger then the others, that hardly measured 1000 tons. While waiting for the ship to be delivered, Deilmann also bought the almost 6000-ton and 1966-built Regina Maris, then lying idle after Lubeck Line had sold the ship in 1976. 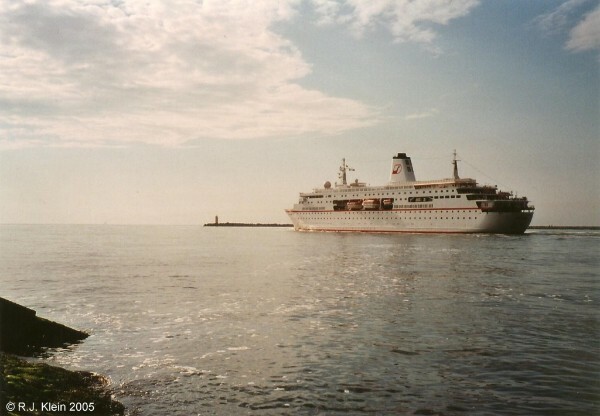 When Berlin came into service in 1980, the ship was marketed as a ship in true German cruise-tradition, meaning the tradition from the large German lines that once made their transatlantic journey's to America. This became a pinnacle for Deilmann, who really wanted to re-create the nostalgia from the liner-era and of course the German involvement in that period. So, with this new theme, the smaller ships and the ferryservices were abandonned in the early 1980's, but from 1984 onwards, the company also started rivercruises in central Europe as another arm of the company. In 1994, they again diversified when the large luxurious sailingship Lily Marleen was bought. To perfectionize the aim of the company to re-create the German liners of the past, and now with more recognition and possibilities to do so, another ship was ordered in 1996 to serve as a new flagship for the line. This ship eventually became Deutschland, a more pattriotic name from the German cruise tradition could not be found. Again ordered from the Howaldtswerke-Deutsche Werft at Kiel, this new ship was to become the largest in the fleet. For the wharf it was particuarly interesting, as theu hadn't delivered a cruiseship since the 1986-built Astor. Her keel was laid there at the 1st of december in 1996. She was built as yardnumber 328 and was of course going to fly the German flag and her homeport was the traditional Deilmann homeport of Neustadt in Holstein. Her tonnage measurement was 22.496 and the ship was 175,30 meters long, 23 meters wide and her draft was 5,80 meters. Space aboard was there for 650 passengers and 270 crewmembers on seven passengerdecks out of a total of nine. The ship was powered by two six-cylinder and two eight-cylinder diesel engines of MaK-DMR design, giving the possibility to sail at an adequate 21 knots. Traditionally, the ship is driven by two screws so no new things like podsystems were used. Under the name of Deutschland, the ship floated out on the 16th of january in 1998. At the 11th of may of that year, she was handed over to the company and became their new flagship. It was meant by Peter Deilmann to design a ship that really re-creates the golden age of transatlantic travel under German flag and so, Deutschland was recieving many elements reminding to that era. Of course this reflects in the targeted market, that were mainly older Germans of whom many sail independently. The German company Partner Ship Design was awarded the design of Deutschland, as they had proven their capability aboard Deilmann's earlier ship Lily Marleen and of course the ships of Aida Cruises. The main entrance is a three-deck high atrium with a sweeping, curved staircase, topped by a massive chandelier. The main public spaces are located at decks six and seven, and the pool and solarium are placed at deck nine. One of the most striking spaces aboard is the Kaisersaal, the ballroom. It has a large, painted ceiling reminding of the first-class dininghall's aboard the German 1920's liners Vaterland or Reliance. In the center of the space is a marvellous crystal lamp, next to more chandeliers, paintings and wall ornaments. The Kaisersaal definitely makes clear what this ship is about. That said, the hall has also a state-of-the-art modern soundsystem. In the ships two main restaurants, that had no fixed table-seatings, all dishes are made of porcelain and both spaces look also very traditional and classic, with red carpeting and many uses of gold and white-cream colouring. There were no discoteque, casino or children's fascilities aboard, instead the ship offers a traditional cinema with seating for 83 passengers. Of course there is a great lounge, the Lily Marleen lounge that even features a fireplace, a wood-decorated shopping gallery and a lido restaurant, that has a seperate galley just like the other two restaurants. Externally, the ship has a very balanced, low profile, sporting a large midships funnel and two rather tall and chunky masts, that also help to create a classic exteriour look. Only two cabins have balconies, so the sides of the ship are not spoiled by those monstrous modernities. The forward Lido Terrace reminds of the Wintergarden's and Palm Courts of the classic liners. An aft bar serves breakfast on deck. Aft, a bar serves breakfast on deck and also located here are the library and solarium, which has wooden and cloth hammocks. A statue designed by Serge Mangin, named Save Our Seas, is also located here. The outdoor pooldeck, in front of the funnel, has of course a teak deck and the interiour pool is classicly decorated in Roman style and is located at deck three. Of the 302 cabins, 224 are outside ones and the doors open traditionally using a lock and key instead of wristbands or smart cardsystems. They have classic moquette floors, are fully airconditioned and have all the standard nessecities like double beds, hairdryers, a minibar and safe. Deutschland was named by the former German President Richard von Weizsäcker at the 11th of may in 1998, so at the same day the company had taken delivery of the ship. Her first cruise started at the 16th of may and took her to the fjords of Norway. She then settled in for her normal cruise-scedule, so she undertook cruises in northern and western Europe during the summermonths, mostly from ports to the likes of Kiel, Lubeck, Travemunde and Hamburg and she was totally dedicated to the German market. During the spring and fallmonths, she was repositioned to the Mediterranean and during winter she took on more far away cruises when she sailed in Asia, South Africa and of course the Caribbean. She sailed very varied cruises, not stuck to just a few route's and she was seen all over the world. From 1999, the ship was used for the German televisionseries Traumschiff, which is loosely based on the American series The Love Boat. Before Deutschland, the Berlin had been used for the same series. In may of 1999, the ship was sent back to the HDW Werft at Rendsburg to have her passenger accomodations rebuilt. In total, 80 double cabins were rebuilt into single cabins, reducing the total passenger capacity to 520. It seems strange, but Deutschland was a very popular ship for single travellers and by rebuilding, these people would be better served, This made to ship even more popular for solo travelers now it was also less expensive for them. In the year 2000, she was used as an ambassador for the Expo 2000 world exhibition at Hannover and in the same year she acted as the hotelship for the German National Olympic Committee in Sydney during the Olympics and she repeated this role in 2004 when she was stationed in Piraeus, Greece during the Athens Olympics. During the FIFA Worldcup in 2006, that was held in Germany, Deutschland's sportive ambitions were again used as an ambassador of the tournament. To make this clear, a light-installation named Blue Goal was placed on her top deck. This was a huge lightstructure in the form of a football goal, designed by light-artist Michael Batz. More of those goals were placed in the city of Hamburg. With laserbeams, shots on goal were portrayed in the late evenings during the Worldcup. That her Olympic role also suited her was clear when she was also stationed in London during the 2012 Olympics as a hotelship and she also gave the German athletes the opportunity to sail beck to Hamburg aboard the ship after the games had ended. A stirr was there during the London Olympics, as Deilmann had previously announced that the ship would be reflagged to Malta because of cost-saving measures. This had caused a lot of protesting already, and in London the debate even intensified because of the international exposuse that was created here. Even the ships captain, Andreas Jungblut, mingled himself into the discussion as he was very opposed to the sceme of reflagging. Deilmann finally gave in in july when they announced that the reflagging was off the table and the ship would continue to fly the German flag. In the afternoon on the 25th of july in the year 2000, the Concord supersonic plane that had been chartered by Deilmann to bring passengers over to New York for a cruise aboard Deutschland, crashed into an airport hotel after the plane had hit debris on the runway of Charles de Gaulle Airport. All 109 people onboard the plane and four people in the hotel died in this tragic incident. Eventually, this crash also spelled the end for supersonic airtravel as all Concord planes were taken out of service. For Deilmann it was a mayor blow of course, as they had lost 96 passengers. Despite of this horrific accident, the cruise with Deutschland was not cancelled and the ship sailed as sceduled from New York the next day. Peter Deilmann passed away in november of 2003 and with his passing, the company had lost the main inspirator. The company continued on as a family-owned line though as Deilmann's two daughters Gisa and Hedda took over the helm. The company sold the Lily Marleen one year later, and also Berlin was sold as they prepared for a new 700-passenger ship that would even more be a re-creation of transatlantic travel from the 1920's. This new ship was planned to be dedicated to the British and American markets and would be topped by two oversized funnels like those aboard the 1952-built United States. This plan never came to pass, though. In 2008, the passengernumbers aboard the companies rivercruiseships had plummited with 45 percent and several ships had been taken out of service. In 2009, insolvency was declared for the rivercruise operations of Deilmann. Seven of the nine rivercruiseships were sold and the finances were restructured. Another blow came on the 23rd of may in 2010, when a fire broke out aboard Deutschland. There were no casualties, but the repaircosts billed 2 million Euro. Of course, several cruises had to be cancelled, again costing several millions more. For a one-ship operation, which Deilmann was at the time, this proved a very hard deal. Deutschland also lost the classification from the German Hotel and Guesthouse Association, losing her 5-star title. According to a press-release from Deilmann, this was after Hapag-Lloyd Kreuzfahrten had complained by the Association as their ship Europa had to be higher rated then the Deutschland. The expensive plans for the new sistership were shelved as those were now not feasable at the moment. In october of 2010, the Deutschland was restored to a five-star rating by the Association as the claim by Hapag-Lloyd was denied. On the 30th of August in 2010, the company was taken over by Aurelius AG, a München-based investor because of the financial position of Deilmann Reederei. Also, the plans for the newbuilt were now on the table again. The Deilmann twin sisters still held 5 percent of the stock, but the family run business was clearly over. During 2014, it became clear that the ship and the company Peter Deilmann were still suffering from extensive financial difficulties. As of january 2015, all cruises of the Deutschland were cancelled by the creditors and the ship laid-up in Gibraltar. In march of the same year, the ship was sold to Royal Caribbean Cruise Lines for use as a floating university in the Semester at Sea program. None the less, for this she would be re-flagged to the Bahama's as sailing under German flag became too expensive. And so, the last German-flagged cruiseship was also off the high seas. At the end of may 2015, it was announced that Deutschland was to be renamed World Odyssey in august of 2015 and rebuilt for her new role for the Semester At Sea program as a floating campus for 600 undergraduate students. For this, she recieved nine state-of-the-art classrooms and a well-stocked library. Her main lounge became a large Union for community sessions and all students aboard got a private cabin. The first 100-day voyage for World Odyssey started at Southampton at the 13th of september 2015. The ship replaced the Explorer in the program, one of the former Royal Olympic Cruises newbuilds from the end of the 1990's that entered the program in 2004. Semester At Sea originates from the early 1960's and was inspired on a voyage undertaken especially for students in 1926 aboard Holland America Line's Rijndam. In 1963, Holland America Line again supplied the ship for the new program, the Seven Seas, exchanged for the new Rijndam in 1966. When Holland America Line restructured in 1970, they pulled back and a man named C.Y. Tung stepped in when he was able to buy Queen Elizabeth from Cunard Line. It would be a huge step forward, but sadly the 80.000 tonner burned while converted to Seawise University in 1971. In the name, 'Seawise' was a play with the owners initials. As a relacement, the ship Universe, also known as Universe Campus, was used between 1971 and 1995. This ship had been the Atlantic for American Export Lines and had been built as a freighter in 1953. Between 1995 and 2004, the Universe Explorer was used, the former Brasil forMoore MacCormack Lines from 1958 and she was replaced by the modern Explorer in 2004. Below, an older picture is showing the ship as she leaves The Netherlands at the 21st of may, 2005, also in a great setting. This time in evening light. Still before she became a floating university, Deutschland had a short interlude for a German firm und her first name, as she is chartered for four voyages to Plantours & Partner because their own ship, Hamburg, suffered some technical problems and has to be drydocked at Lloyds Werft in Bremerhaven for maintainance. Deutschland's brief interlude service for Plantours started at the 9th of june and ended at july the 29th, when she recieved her upgrade for Semester At Sea. This initiative of a floating student campus is now lead by Royal Caribbean International and the ship was updated inside to act as a floating university for use through the wintermonths. In november 2015, just a few months after she entered service in her new role, the announcement was also made that she was chartered to Phoenix Reisen from the beginning of the 2016 season onwards for the summermonths. With this company, the ship returns to the German market, where she still is a very popular icon. Her charter with Phoenix was signed for the coming five years at least and she will mostly be sailing northern European cruises, next to the winter studentsailings for Semester At Sea, for whom she will sail under the World Odyssey name. Deutschland's funnel was repainted in the colours of Plantours & Partner for her two months charter in june and july of 2015. She is shown at Bergen, Norway at the 11th of june during the first of four cruises for Plantours.